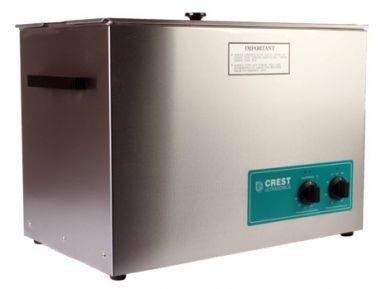 Crest 5-gallon tank capacity with analog timer and adjustable thermostatically controlled heater. A cover, main on/off switch, and drain valve are all included. 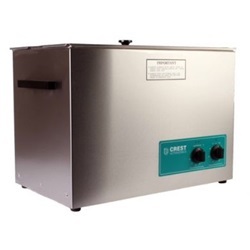 Has a sweep frequency of 45 kHz and all stainless steel enclosures resist chemical spills and will not crack. Has ceramically enhanced transducers and all timers have continuous operation. Dimensions of inside tank: 19.5"L x 11.75"W x 6"H; Overall Dimensions of unit: 21"L x 12.75"W x 14.5"H.